Why does the table title does not follow directly after the table number? 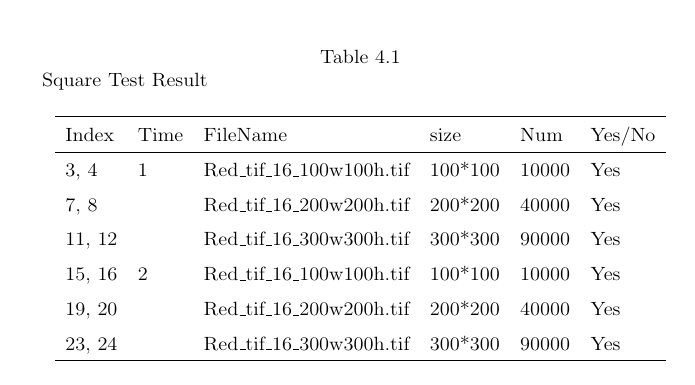 As shown below, my table title does not follow directly after its number, it starts from another line. I need your help to figure out why this happens. How I can fix this problem? Now that we know what class you're using, we can see that putting the caption on the next line after the tablename and number is part of your class file. You can confirm this by running the MWE I've edited into your question. puthesis-cot.cls dictates this behavior in a rather long and complex \@makecaption definition. That way the solution will work with your documentclass. You may need to fiddle with the other conditional branches in the definition for other figures and tables in your document; this only works with the MWE in the question. I don't have the time to sort through the various branchings, so I only made it work in this one case. By the way: the puthesis-cot.cls wasn't available at the site you linked; I had to Google it to find it. It's kind to link to a non-standard document class in your question in the future. I suspect the problem you report -- the fact that the first part of the table caption is centered, whereas the second part is set at the far-left of the next row, after a line break -- may be due to you using an obsolete or otherwise substandard version of the document class file puthesis-cot.cls ("Purdue University College of Techology"). Note that the second part of the caption is centered rather than set flush-left. The date associated with the class file downloaded from github is Dec 2014, i.e., quite recent. If you do not want a line break between "Table 1" and "Square Test Result", I think the easiest way to proceed would be to load the caption package in the preamble. Not the answer you're looking for? Browse other questions tagged tables captions or ask your own question. Why does ltablex skip a number in captions? Why my table does not have four-sided edges?